This listing will be retired in September please refer to new VRBO listing number 1611812 for availability and reservations. Prices include free Wi-Fi Internet access in room. Note: We will not rent to vacationing students or singles under 25 years of age unless accompanied by an adult guardian or parent. The maximum number of guests is limited to five (5) persons including children (4 adults maximum without children). Updated in 2010 with new flat screen HD TV and entertainment center. Updated again in 2017 with new cook ware in the kitchen, new living room furniture including new sleeper sofa, and new dining table and chairs. This condominium is a beautifully decorated one bedroom with a queen bed, a comfortable queen-size sleeper sofa, and built-in bunk beds in the hall area. There are two color TVs (1 flat screen HD), one VCR two DVDs and a stereo radio with CD. The unit is very peaceful since it faces a beautiful marsh from the deck side (non parking lot view, no parking lot noise). Located on beautiful Hilton Head Island which Travel + Leisure Magazine picked as the top island in the U.S. and is so spectacular, it also ranks second among the Top 10 Islands in the world in 2017. The entire resort is designated as non-smoking except in designated areas and does not allow pets (of any kind, resort rules). For the convenience of our guests, Hilton Head Beach & Tennis Resort features a restaurant (sports bar) & Tiki Bar (pool) onsite. The sports bar has recently been updated and has numerous HD TVs for you viewing pleasure. Jamaica Joe'z oceanfront pool bar serves lunch daily in season and boasts the most beautiful sunrise on the Atlantic Coast. If tennis is your game the resort features a lighted ten court tennis center, fully equipped pro shop, and a professional staff ready to serve your game. Children and adults alike will enjoy the playground area and picnic grounds, complete with BBQ grills. Beach volleyball can be enjoyed as well as bike rentals in season. Many great golf courses are located within a 10 to 30 minute drive (resort located between Palmetto Dunes and Port Royal Plantations). 1 hair dryer is supplied for your use. Owners also supply 6 bath towels, 4 hand towels, 4 wash clothes, 2 rolls tiolet paper, paper towels, and 2 bars of wash soap (hotel size). Towels cannot be used at the beach/pool so bring beach towels. 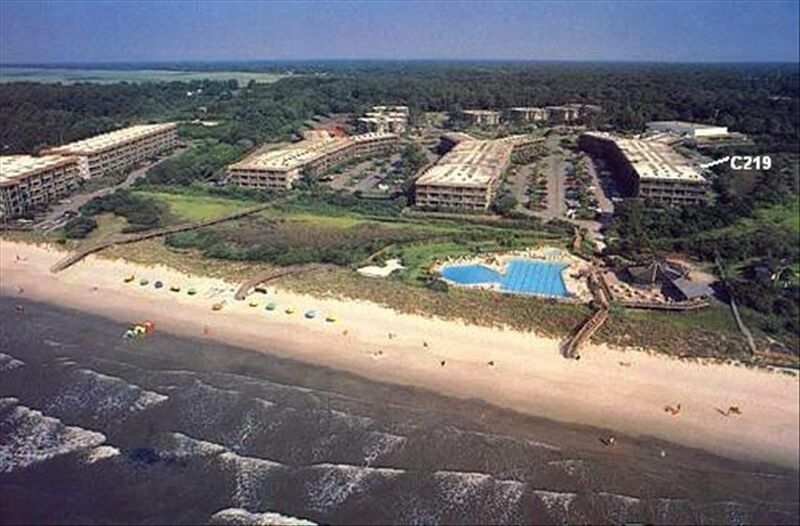 Resort is located on Folly Field Beach. Secure gated beach front resort with pools, restaurants, bar, workout facilities, tennis courts, and many other amenities. Because of the unit location you have a limited ocean view from the balcony. Building unit is located in is directly on Ocean/beach and next to pool. Because of the unit location you have a limited ocean view from the balcony. Bath towels only, hand towels, wash clothes only. Bring beach towels as they are not provided and you cannot take bath towels to the beach. Does not have ice maker but ice trays are provided. Peaceful marsh view - Not a Parking Lot view!! Not on resort property but numerous courses to choose from on HHI and just off island. Largest beach side pool on HHI!! Also a great kids pool right next to building unit is located in! Washers and Dryers (close to unit), Unit located in building next to pool/beach, Great Family Resort! Lots of Kids' Activities in the Summer! Close to numerous golf courses. Tiki Bar with food and drinks next to pool (April to September). Sports bar with numerous flat screen TVs at main building. Bike rentals on site. Bike rentals available at the resort. Adventure Golf and Fun Center just down the road (walking distance) for the kids! Walking and Bike Paths, resort is located between two of the island's plantations (close to several golf courses). Bike rentals on site. Cleaning fee of $85 and 11% taxes are included in all rates. Daily rate rent cost based on 3 days, for greater than 3 days contact owner for quote. Additional rate charge for some holiday weeks of up to $50 max. Rental requires a separate refundable security/damage deposit of $150 for 2 weeks or less and $250 for greater then 2 weeks.